BIG Launcher v2.5.3 – A fast and simple Android interface for seniors and people with vision problems. Or even you, if you hate millions of icons. 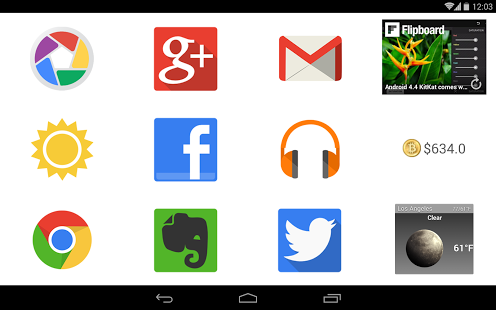 The BIG Launcher replaces the user interface of any phone or tablet with Android 2.1 or higher. It is designed in consideration with seniors and the visually impaired to provide maximum readability and easy use. Large buttons are easy to use – they are controlled by single touches, leaving no room for errors. Access all the functions of the phone via a simple interface. No confusion, no complications. Large texts and color coded icons help you to easily distinguish between items. Quickly access favorite contacts from the menu or by putting them directly on a home screen. Browse through the call history and easily call back or reply with a message. SMS messages are sorted by conversations. Large font and color coding is used to display the message thread. Reply easily to any message with the easy to use SMS editor. Writing a message has never been simpler. Optional full screen SMS notifications allows you to rapidly call back or reply to the message. Use big shortcuts for your most used applications or find them quickly in the app list with instant search. Recently used apps are at the top of the list. Shortcuts like web bookmarks can also be placed on the home screen. Hide the apps you don’t want to use to keep your app list clean. Useful for restricting access to those off-limit apps as parental controls or to protect users from getting lost in the navigation. High contrast color schemes and three different font sizes allow you to use your phone without glasses. Additional color themes are available for download. Extended support for Talkback screen reader allows legally blind users to use their phone with ease and confidence. Older people love the big battery and signal indicators, direct dialing of their favorite contacts and the SOS button with geolocation for the cases of emergency. Kids appreciate colorful backgrounds. Full screen mode and password protection prevent the users from getting lost or from deleting something important from the phone. This creates a completely safe mobile environment. Customize BIG Launcher easily to match your needs – set up an unlimited number of screens with apps, contacts, shortcuts or widgets. Swipe between them or use the buttons to group related functions. 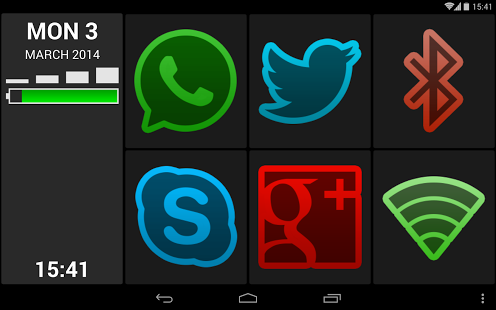 You can choose from many downloadable visual themes and icon packs to customize your phone. Also, every screen can have a different background.